Pages, if I’m not mistaken, are the messengers – delivering messages, so unexpected news may be arriving. Swords represent the element of Air, thought, and intillect – logic, and reason. The keywords that come to mind when I see this card are flexibility and preparedness. This page, although holding a sword, does not look as if he’s prepared to strike, but instead, looks almost as if he’s striking a pose, or dancing. There are clouds around him, but to me, they look almost like a “mist”, as if to say there are forces at work, change in progress. I’m floundering a bit with this card this morning, second guessing myself, and I’m not sure why. Generally, I associate it to Taurus energy, and a tendency to be work oriented (almost to a fault). In readings, I usually caution against workaholic tendencies and remind the person to remain flexible. The story I often associate with this card is that of a tree. If a tree tries to resist wind when the wind blows, it will snap. If it tries to hold it’s position when the wind blows, it will break. However, if the tree is flexible and able to bend with the currents of the wind, it will survive the storm. Be flexible and bend like the tree in the wind, and keep the mind open to new possibilities. Be prepared… change is in the air. Messages of a fact-finding nature. Young, intelligent individual. A flair for secrets and spying. Individual with an impressive network that can relay information. 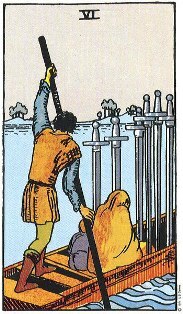 The Page of Swords asks you to embrace these difficult situations. Think of them as trials designed to test your mettle. If you accept and prevail, you will become stronger and more resilient. In meeting these challenges, you are encouraged to use the tools of the Swords suit – honest, reason, integrity and fortitude. The first court cards are the Pages/Princesses. It is always best to imagine them as young, and with a letter or scroll in hand or on their person. The element of the pages is “Earth” indicating something young, growing, a seed planted. So the Page of Wands would be “Earth of Fire” – the seed of fire, so to speak. The spark. Pages most often stand for children, though they can also be said to be the “Fool’s” alter ego. So, an adult who is child-like enough might also be a page. The Querent, if starting something very new and fresh might also be said to be “The Page” – in this case, a kind of apprentice. Deck-wise, if a Page, they can be male or female. If a Princess, likely a female young person; the prince will be the male young person. A message relating to a problem either solved or ending badly, or a message that gives one an idea or solution. Sometimes about illness. Sometimes rumor or gossip – in which case, check it out carefully, it might be false. You can’t shut up this kid. “Why? Why? Why?” he/she’s always asking. And even more alarming, anything they hear, they’ll repeat, just blurt it out in front of people. They’ll go up to Aunt Hazel and say, “Are you carrying a baby? Mommy says it looks like you are….” On the positive side, this kid could be quite a brain, good at puzzles, quick to learn. And they already know how to use the computer better than you do. Likeable, but also the most aggravating of kids because whatever you tell them to do, they’ll argue about it. You have to watch that they don’t become “know-it-alls” or tattletales. Personal Notes: Well, I can connect a few things from the sources to what I’m currently going through. I am shifting back into a learning phase, and coming out of a depression. That’s a familiar cycle for me. The depression strikes when I feel “bored”, or have a complete lack of interest in learning anything new. When creativity is blocked, the muse goes on strike, and I feel completely uninspired. Then, something in me sparks, I get the hunger for knowledge again. I drink in as much knowledge as I can, studying a particular topic or starting a new project. Once the knowledge-drinking phase comes to a close, the creativity begins as I start to put into practice what I’ve learned. I have been mentally lazy, there’s no doubt about that – and I think everything I’ve written in my blog to date shows that pretty clearly. I am learning to think things through, and to exist on more of a mental plane. I did just write about studying palmistry, so I’m sure that’s part of what’s being expressed here – but maybe I’m being cautioned not to talk about that too much. When I get excited over something, I tend to talk about it a lot, to share what I’ve learned, because sharing it helps “cement” it in my mind… but it can get annoying to other people, I’m sure. The source definitions remind me a bit of two of my three children. Atlas was the one who always knew everything. In his younger years, hanging out with him was like trying to have a conversation with an encyclopedia. And Stinkerbelle is the one with the tattle-tale tendencies, the one who can’t keep a secret or who is subject to gossip. Maybe I need to look for reflections of those aspects within myself. Will have to spend some more time with this card later. I’m bothered that it seems so perplexing to me today when normally I’ve had no problem with it. It’s hard not to laugh hysterically because this card couldn’t be any more accurate or any closer to the truth. Bullseye! Nine of Swords represents trouble sleeping, possible nightmares, heavy stress, worry, not knowing what actions to take or how to navigate through change. The nine’s represent the end of a cycle, and in this case, the quarrent is “freaking out” a bit about what’s going to happen next. When I do a reading for others and they draw this card, I encourage them to let go of their worries and stop trying to micro-manage the details of their life. Let things run their course and understand that you can’t control everything. Let go of the weight and the worry and trust that the Universe will guide you to the right actions. Nightmare; bound by your own fears; difficulty sleeping at night; personally imposed misery or disappointment; worrying needlessly; being disappointed in someone; possible danger – check surrounding cards. It makes sense that the figure on the Nine of Swords is in bed because it is during the night that our griefs and regrets come to mind most intensely. The quiet darkness strips away the distractions of the day, leaving us alone with our thoughts. Who has not lain awake at 4 A.M. filled with worries that refuse to go away? 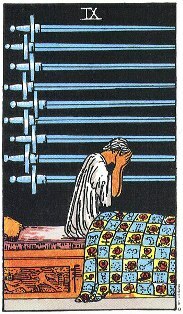 The Nine of Swords represents this unhappiness which can strike us at any time. Unlike the pain of the Three of Swords which seems to come from without, the Nine of Swords represents the pain that we generate from within. What tortures we put ourselves through when our fears and doubts overwhelm us. Worry is probably the most common. Have I done enough? Will everything work out OK? What am I going to do? The thoughts go round and round – impossible to turn off. Guilt is another source of pain. When we have done something that we feel is wrong or hurtful – or failed to do something we think we should have – the distress can be very real. It is worse when nothing we do relieves the bad feelings or makes them go away. Finally, there is just pure anguish. Sometimes the pain of life is so total that all we feel like doing is crying into our hands. 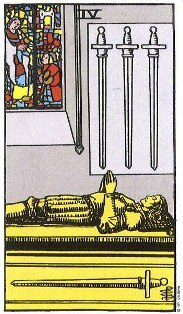 Needless to say, the Nine of Swords is not the most pleasant of cards, but it doesn’t always indicate major distress. Often it is just a sign of some element of unhappiness or trouble – a vulnerable spot in your life. This card is often a warning from your Inner Guide that the path you are going down may be a difficult one. If you approach the Nine of Swords in this spirit – as a caution sign – you will be able to use it constructively. Examine your situation carefully to be sure you are making the best choices. Even a small change can make all the difference. Nine is a card of completion (so is Ten, but we’ll get to that). Like the Hermit, who connects to the nines, it is a card where something is finished and the person in turn steps back to look on what he’s done, earned, or gained. Nines are among the most powerful cards, usually granting the Querent what it is they, like the Hermit, are seeking. This card came up in a reading T did for me over the weekend, in the Higher Power position, along with the Beauty fairy oracle. It brought me to tears and caused a whole lot of reflection and introspection. Seven of swords indicates dishonesty, thievery, manipulation…. someone taking something that doesn’t belong to them. When it came up with the Beauty card over the weekend, it sent me through a bit of a time warp making me aware that I’ve allowed others to take away my sense of self-worth, making me feel as if I’m anything but beautiful. This card seems to shake the spiritual foundation. We spend so much time and energy, put so much faith in a thing, a circumstance, a person – and when we realize that it’s been an illusion or that we’ve been lied to, it’s like an earthquake to the soul. I suppose the card is coming up for me again this morning to remind me that I’ve got some healing to do and need to learn how to rebuild my trust, and re-discover my own sense of beauty. The Seven of Swords is tied to the Five of Swords because both cards involve separation from others. On the Seven we see a man tiptoeing away from society (the colorful pavilions). He’s taken some swords and seems rather pleased with his successful heist. He gives the impression of having secret, solitary plans. 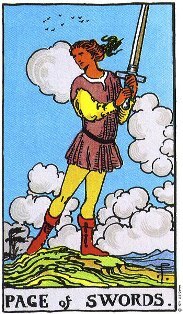 This card sometimes represents the “lone-wolf” style – the desire to run lone and free. In films, the lone-wolf hero always acts totally on his own. He discovers, investigates and solves every problem using only his own wits and resources. He believes he’s successful because he ignores the fumbling efforts of ordinary people. Sometimes the Seven of Swords means that you are running from something – commitment, responsibility, hard work, love. You may be procrastinating, letting problems slip because you don’t want to deal with them. Sometimes we just have to face what has to be faced. 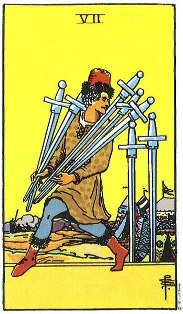 The Seven of Swords lets you know when you might be making things worse for yourself and others by running away. The Seven of Swords can also indicate a hidden dishonor – a choice you or another has made that does not do justice to the highest. We all make wrong choices that we want to hide. Some of these are minor, some serious. Your inner voice will tell you when this is happening. When you see the Seven of Swords, take a good look at what you’re doing because hidden dishonors will eat away at your happiness and self-respect. A thief sneaks off with 5 out of 7 swords. This is the “Thief” card. It implies that someone is stealing something from you, your honor, your ideas, your time. They may be spreading gossip about you. How to take control of this situation? You have to be equally sneaky. Sometimes, to win a race or battle, the Charioteer must direct his horses around instead of straight on. You may feel like you want to go charging in, be confrontational, but this is not going to work. That is the out-of-control solution which will allow the thief to play the innocent. To catch a thief, you must be a thief. Last year, I wrote a poem called Ice Queen that was partly inspired by this card. In this card, we see a woman sitting on a stone block, an ocean behind her. She’s blindfolded, and she has two swords crossed in front of her. Above her, a sliver of moon hangs in the sky. This is, to me, a woman scorned. She’s been hurt, and because of her past pains, she guards herself against present situations, isolating. The blindfold she wears makes me think of the phrase, “Out of sight, out of mind”. She doesn’t want to see what’s before her. These wounds she’s suffered are emotional, which is why she’s got her back to the ocean, as water represents emotions and feelings. Her crossed swords are like a sign that says, “Keep Away.” Her heart has been broken – severely – and rather than risk having it broken again, she keeps it locked away, tightly guarded. Swords represent the element of air, and the realm of intellect. 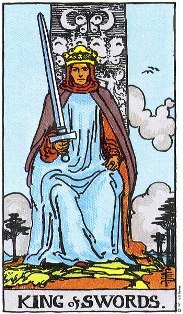 This could indicate that the woman in the card is thinking too much about past experiences, allowing thought to over-ride emotions. She’s trying to be logical in guarding herself, thinking she’s doing herself justice by engaging in self-preservation, but what she doesn’t realize is that by cutting herself off from her own emotions, she may be preventing her own healing and missing wonderful emotional opportunities. The moon indicates fears and potential depression based on those fears. The realm of the moon is one of illusion and mystery. The person in this card is afraid of the unknown (hence, the blindfold keeping her from seeing the truth). This card is represented by the number two, and twos indicate indecisiveness, choices – and they also mean good things are on the way, but may take longer than anticipated – as if life is waiting for the right choice to be made so that the rewards of that choice can be delivered. Reversed cards mean one of three things – either the energy is just manifesting and hasn’t reached its peak yet, the energy is waning – already peaked and on its way out, or that the more negative attributes of the card are being projected. In this particular case, I believe it means all three. I’ve gone through this phase of being emotionally guarded. Then, I took all my shields down, put my heart on a platter, and handed it to someone who would eventually shatter it. Then, I went back to being guarded… moreso than ever. So I think I’ve been here in the past, I overcame it, and now I’m back in the position of guarding my heart. It makes me think of the Tarot reading for July. One of the cards in that spread (position 10, Advice, Two of Cups) suggested that I express my emotions to the person I’m with, to tell them openly and honestly how I feel. Well, I don’t feel like I’m in a position to do that just yet, and the two of swords is making that clear. I’m afraid to do that, I have reason to be afraid to do that… and so I try to approach the situation with logic and reason rather than with emotion and feeling. So yeah, I’d say this card’s energy, as I understand it, is right on time, and very strong. Can’t see forward and can’t see backward; stuck between two opposites; coming to grips with the duality of a situation; dealing with gossip; indecision; a search for balance. On the Two of Swords, we see a young woman who has put a barrier of swords across her heart. Her rigid posture tells us of her struggle to keep her feelings under control. She is fending off any approach from the outside. “Nothing comes in, and nothing goes out,” she seems to say. The Two of Swords is about the barriers we put up between ourselves and others and those we create within ourselves. Internally, we block off emotions and refuse to feel them. We avoid looking at the truth and pretend that everything’s OK. We think one way, but feel another. In countless ways, we divide off parts of ourselves and try to maintain them even when we know they need to be reconciled. In readings, the Two of Swords often appears when you are not willing to accept some truth about yourself or the situation. What are you really feeling? Are you resisting tender feelings because you might be hurt? Are you furious even though you’re smiling? What are you refusing to look at? Notice the blindfold on this woman. She can’t look at the truth or even acknowledge that there is trouble. The most common barrier is a closed heart. When we cut ourselves off emotionally, we sever the connection that allows our love to flow outward. Sometimes this action is necessary, but it always comes at a great price. Every time we close off our heart, we find it more difficult to open again. Another barrier between people is a deadlocked situation. When two parties are set in their positions – cut off from each other – there is a stalemate. To break it, the “opponents” must come out from behind their swords and listen to each other. 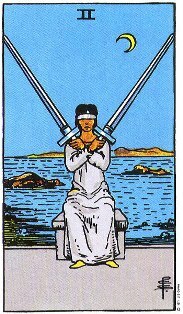 The lesson of the Two of Swords is that barriers are not the answer. We must stay open if we are to find peace and wholeness. This is the infamous blindfolded lady with the crossed swords. Crossed swords suggest a clash of ideas or words. The blindfolded lady, indicating impartiality, cannot uncross the swords, but she keeps them still. This is the knowledge of how to compromise, keep these two sides in balance and at peace. Note that this is a temporary compromise. The Querent may be in the middle, or just forced to accept it. Either way, they must be told that it won’t last. The direction of your new brain power here is how to keep these two ideas from fighting, to hold off trouble and make peace. King of Swords is about law, order, justice, fairness, rules, and regulation. Connected to the Emperor, I believe, this King enforces “right” action. When this card surfaces, it could mean that the quarrent (in this case, me), may be the “middle man” who solves disagreements between others. This king is a problem solver who insists that the right actions are taken. Kings represent a masculine, fatherly energy. When we think of motherly energy, we think of compassion and nurturing. When we think of fatherly energy, we think “enforcer” and “provider”. Swords represent action and transformation. Add those together and you have a masculine energy enforcing transformative action. Coupling this with the Stand Your Ground fairy oracle from this morning, I actually feel pretty good about this card’s energy today… he’s letting me know that I’m in the right position, that I’m taking the right kinds of actions, and that I’m viewing things objectively (as opposed to being clouded by emotional attachment or personal gain). Additionally, if we look at last week’s repeat cards of the Letting Go fairy and the 5 of swords, these cards confirm that I’ve corrected the problem. I’ve gone from “Letting Go”, to “Stand Your Ground”, that’s a complete transformation right there. The five of swords indicated a selfish attitude, one privvy to immoral behaviors based on self interest – to the King of Swords who is about justice, fairness, and balance…. another complete opposite. I’m not sure exactly what I did to flip this situation, but whatever it was, I must have done it correctly and I’m being urged to keep on keepin’ on with whatever it is I’m doing. *Note: This source lists swords as an air element. I learned it (and resonate with it) differently, swords being the element of fire, transformation, action (as opposed to thought). I’m aware that there is no “right” or “wrong” way of understanding this, and that intuition is meant to lead the way. Whether the reader chooses air or fire for swords, either way is fine… as long as they choose one and stick with it. For me, swords will always represent fire and change. Call him “The Judge”. His kingdom is the kingdom of high ideals. Loving, friendly, but distant, the one thing everyone says about this man is “He’s Fair.” Likely a lawyer, judge, musician, politician or designer, he is a patient, careful man, with very high ideals. Here is a man of eloquence, so good with words and debate that he can easily see the other side of every argument. This does not keep him from his own strong beliefs, beliefs which he expects his family and friends to adhere to. Not that he isn’t a good father; he can be kind, playful, a loving and faithful husband. He treats his wife and kids fairly, hearing them out, acknowledging when they are right. But if he is against child labor, and won’t wear certain shoes to protest it, no one in his family can wear those shoes either. And he’ll be bitterly disappointed in them if they do. Unlike the King of Cups, this King does not put “Family first, right or wrong.” Ideals come first, and he can be unforgiving of the family member who is weak or more “human” than he. He is willing to go on hunger strikes, fight or die for these high minded ideals. He will not budge when it comes to upholding them, not even for his nearest and dearest.